If you take scenario paintball seriously, then you use gear that's not only as realistic as possible but performs well too. That's why serious scenario ballers love the BT M4 Carbine Paintball Marker. This gun not only looks the part but can take a beating and still remain accurate and powerful. 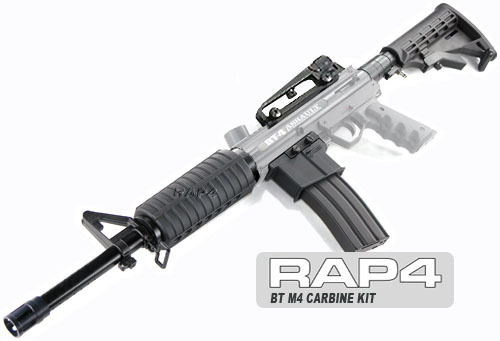 The BT M4 Carbine Marker is built on top of the reliable BT4 paintball gun; an excellent base of operation for reliable performance and customizable platform. The BT4 receiver is sturdy and easy to maintain and clean when needed; accessories are easily added and removed, making your gun an excellent blank slate for further upgrades. 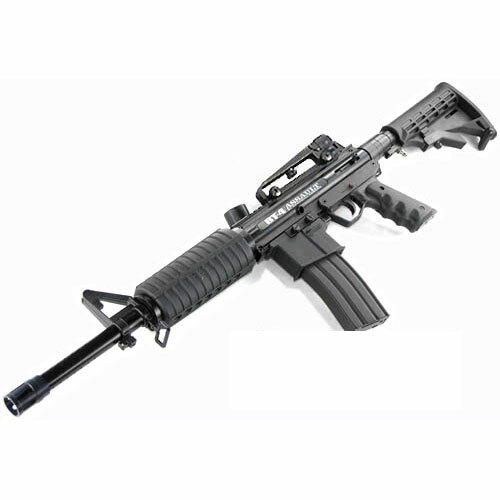 The BT Paintball Gun M4 Carbine Marker includes a realistic carbine barrel kit that features a 16 inch barrel, realistic M4 hand guard and front sight. The muzzle brake can be removed and replaced with a paintball gun silencer or other style brake if desired. Other features on the BT4 M4 Carbine marker that make it as realistic as possible are an M16/M4 carry handle, adjustable carbine stock and M4/M16 magazine. The magazine is non-functional (this is a hopper fed gun) however really contributes to it's realistic M4 replica look. Buy the BT Paintball Gun M4 Carbine Marker from ChoicePaintballGuns for the lowest price you will find on the internet. We are glad to drop ship these guns directly from the manufacturer to save you time and money. You will be greatly pleased with our service and how easy it was to purchase.